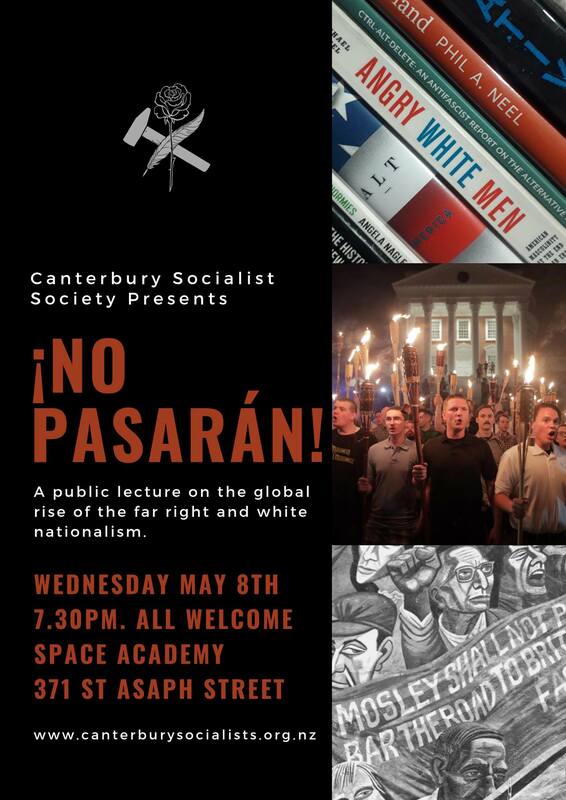 In the wake of the chilling violence in Christchurch this year, the Canterbury Socialist Society has brought this event forward to provide some analysis on the state of the far right globally. Mark Balderstone is a member of the Canterbury Socialist Society Executive and will be speaking on the rise of the far right today. Right wing demagoguery is in power – Trump in the United States, Modi in India, Duterte in the Philippines and Bolsanaro in Brazil. Moreover, from Génération Identitaire (Generation Identity) in Europe through to the “Unite the Right” rally in Charlottesville, the white nationalist right are seeking to reassert themselves in world politics. Anders Behring Breivik, Dylann Roof, and the Christchurch shooter have shown that advocates of these politics are willing to perpetrate acts of extraordinary violence to achieve their aims. Understanding where these groups have come from takes study of the far right over the past few decades. Drawing on recent scholarship, Mark will provide an outline of where the far right are today and how they got there. All are welcome to attend, however some content will be sensitive and potentially disturbing – please use your discretion when attending.